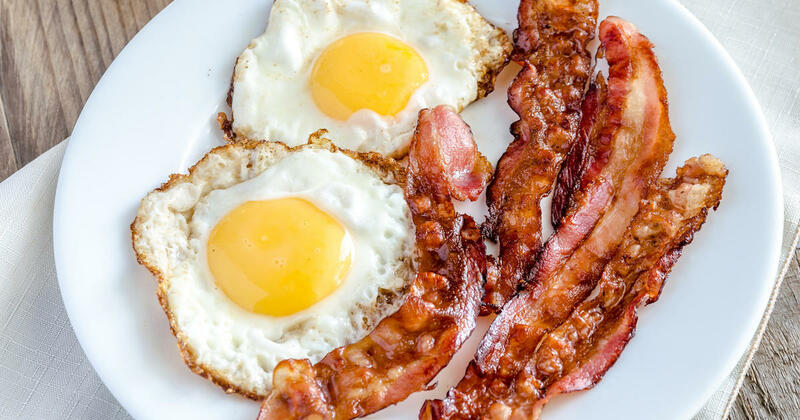 They are well-established elements of the American language, but animal rights group PETA suggests that common expressions such as "bring the bacon" and "kill two birds with one stone" contain a damaging message. Idioms like these, so the group, are verbal remnants of "speciesism" and should be replaced by more favorable variations of the theme. "Words matter" (19459005) PETA tweeted Tuesday. "As our understanding of social justice evolves, our language evolves with it, so you can remove the speciesism from your daily conversations." The animal rights organization then added a color-coded card on which they see offensive expressions the left in red and what they consider to be acceptable substitutions on the right in green. Instead of "killing two birds with one stone," how about "feeding two birds with a scone"? Instead of "bringing the bacon home," try "bring the bagels home." In the table, PETA also recommends replacing "the bull by the horns" with the more harmless ones , Take the flower by the thorns. "Instead of the phrase" hitting a dead horse ", it offers the somewhat weird alternative" feed a fed horse. "And last but not least, the animal rights group proposes to replace" the guinea pig "with a sentence that is an inanimate symbol of scientific Emagazine.credit-suisse.com/app/art … = 118 & lang = DE Experimentation includes: "Be the test tube." In a sequel to the group Englisch: emagazine.credit-suisse.com/app/art … = 118 & lang = en homophobic language and wrote, "Just as it became unacceptable to use racist, homophobic or Ableistan language, phrases that banal animal cruelty disappear as more and more people appreciate animals and start" bringing the bagels home " instead of bacon. Just as it became unacceptable to use racist, homophobic or Ableistan expressions, sentences that trivialize animal cruelty the more humans value animals, and begin to bring the bagels home instead of the bacon. As was to be expected, the backlash of skeptical Twitter users with many hordes of people res in their own tweets was thinking about PETA's campaign against some of the most common I would open a parody PETA account, but you would never be able to tell the difference. On behalf of I reject this tweet from the Bagel community. Please phrase this because we are extremely offended in their name. – Adultish Gambino (@iffykaysar) December 5, 2018  However, there was also a flood of tweets from social media users sympathetic to PETA's cause. Some have even come up with additional proposals for more animal friendly substitutions. Instead of "curiosity killed the cat," for example, proposed a Twitter user, "curiosity aroused the cat." Instead of eating "crow," someone else typed "eating snow." Now, PETA uses these user-generated ideas as inspiration for a new social media call for innovation proposals. "To the haters: why so little negativity in the world, why not use the language in a way that promotes animal friendliness?" The group wrote today on Twitter. "To everyone else: Add your own anti-species phrases below!" And if these phrases were to be crafty and humane-both funny and non-violent-they may, as the vernacular says, truly be the best of both worlds.